Ito is a set of transformable furniture collections from Clei. This furniture unit includes a wall bed and adjustable sofa. 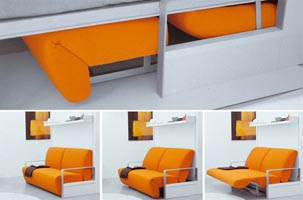 Ito can be transform into a sofa or bed within a minute with one simple movement and perfect for a limited space. The sofa has a sliding and reclining seat system with integrated footrest. When the bed in use, the shelf above the sofa will become a support for the bed. The white and orange color combination of this unit will brighten your interior space. Ito is a space saving modern furniture set with innovative design. Manufacturers of High Quality Modern Furniture . Most of us dream for a Beautiful house with the best equipments looks. The reclining sofa couch in leather match gives your room a touch of luxurious look with its high quality prominent leather. The comfortable cushioning and scoop chaise pad seating makes it a perfect piece of furniture for your relaxing living room.